We also gladly supply small quantities for instance for research and development. If you would like to buy manganese or find out our current manganese price please click here for our contact information. Naturally occurring manganese oxides like manganese dioxide have been well known and used as natural pigments for a long time. Black manganese oxide pigments were inter alia found in the approximately 17000 year old cave paintings in the caves of Ekain and Lascaux. In glass production manganese compounds have been used since the Roman Empire in the fourth century BC. In this application manganese has two different functions. If manganese dioxide is used this will lead to an intense brown-violet coloration of the glass. If manganese(III) oxide is used in iron-containing glass instead it will remove the colour by converting the blue-coloring iron(II) oxide to the pale yellow iron(III) oxide. In 1774 Carl Wilhelm Scheele found out that manganese dioxide must contain an unknown element. In the same year Johan Gottlieb Gahn isolated on the initiative of Scheele manganese by reduction of manganese dioxide with carbon. It was first named manganesia nigra after the Latin term for manganese dioxide. After the discovery of magnesium the name was changed to mangan(ium) in order to avoid confusion. Due to the similarity to magnetite (or magnes masculini sexus) Plinius named it magnes feminei sexus (as manganese dioxide is not magnetic) which was then changed to manganesia in the Middle Ages. In 1839 one discovered that manganese improves the ductility of iron. When Robert Mushet showed in 1856 that by adding manganese a mass production of steel in the Bessemer process was possible, large quantities of manganese were used in steelmaking within a short time. As of 1866 manganese dioxide became also technically relevant when Walter Weldon developed the Weldon process for chlorine productione. In this process hydrochloric acid is oxidised to chlorine by using manganese dioxide. Manganese is the third most transition metal after iron and titanium. With a content of 0.95% in the continental crust it occurs about as frequently as phosphorous and fluorine. It is considered as a frequent element although it does not occur as an element itself but always in form of compounds. Besides manganese silicates and manganese carbonate it is mostly bound in oxides. The following most common minerals are often grouped together: manganite, hausmannite, braunite, rhodochrosite and rhodonite. Exploitable manganese ores may be categorised into three groups. The first one are rhodochrosite braunite ores which are included in Precambrian volcanic rocks. These ores can mainly be found around the southern Atlantic Ocean, for instance in Brazil, Guyana, the Ivory Coast, Ghana, Burkina Faso or in Congo. Ores of the second type can be found in highly oxidised iron- and silicate-rich sedimentary rocks of the Proterozoic. The deposits of that type near Hotazel in South Africa and Corumbá in Brazil are two of the biggest manganese occurrences of the world. The third type are manganese slate ores which formed in the flat shelf sea by sedimentation. Occurrences in Gabun, Ukraine and other countries around the Black Sea belong to this type. About 75% of the known manganese resources are located in the South African Kalahari. Larger manganese reserves can also be found in Ukraine, Brazil, Australia, India, Gabun and China. The biggest manganese producing countries are Australia, China and South Africa with a total global production of 10.8 million tons in 2009. 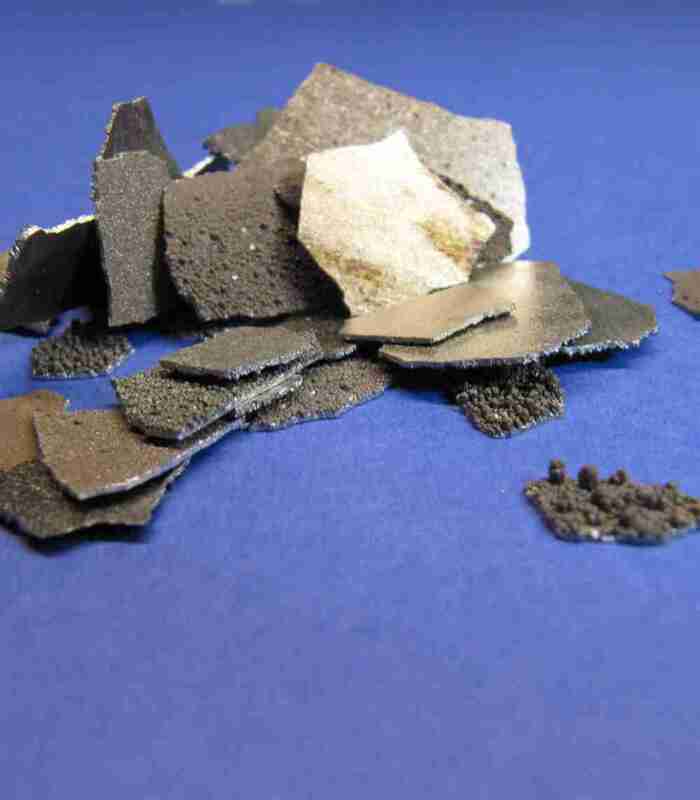 Larger quantities of manganese occur in the so-called manganese nodules (porous concretions of heavy metal oxides with a size of up to 20 cm) in the deep sea, which can consist of up to 50% manganese. Particularly high concentrations of manganese nodules are located in the Pacific Ocean south of Hawaii as well as the Indian Ocean. An exploitation of manganese nodules, above all for the extraction of copper, cobalt and nickel was examined intensively at times but failed until now due to high technical requirements and high exploitation costs with at the same time comparatively low prices for metals mined on land.